We are all going to have to change; to learn to share, to care and to play again. Lets take to the city, turn the social rules upside down, dance in the streets, sing, party and bring some healthy chaos to this dull order. The party starts at 5pm prompt, however in order to arrive safely and sneak along, we recommend that you arrive early and have a drink in one of the many nearby bars. 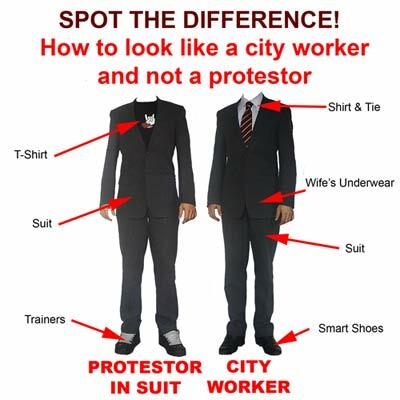 Remember stealth and cunning is the key to getting this party started, dress in disguise (look as corporate as possible, see the dressing up guide below), if you are asked any questions insist that you work there and are just dancing along with everyone else. If you are going to bring drinks, make them subtle, hip flasks not cans of Stella. Alternatively drink in the nearby bars. Join in the singalonga - print out a song sheet available below. Bring friends, bring instruments, bring bands, bring drinks and cakes to share, bring smiles and bring your dancing shoes! corporate chaos causers and all round bad eggs!